If you’re not using macros then you’re missing out. Apart from simply practicing and learning your class, nothing else can improve your play and elevate your overall performance in the way that using macros can. Unfortunately, I think a lot of players don’t bother with them because they either: don’t know about them -or- are intimidated by what appears to be a bunch of techie mumbo jumbo. 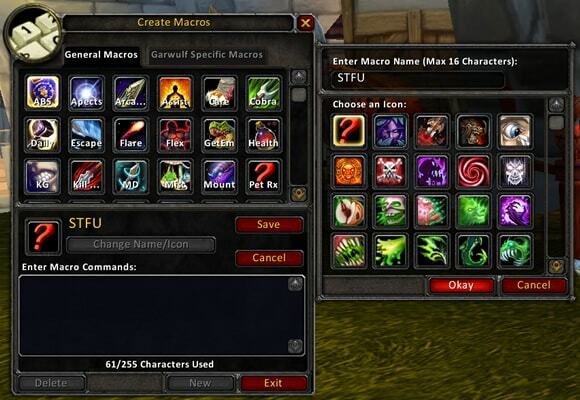 1) First off, pick a macro that you want to use for your hunter by selecting one from my macros page. Copy it to your clipboard by selecting all of the macro text, then hitting ctrl+c (command+c on a mac). For this example, I’m going to show you how to create a macro for Silencing Shot. 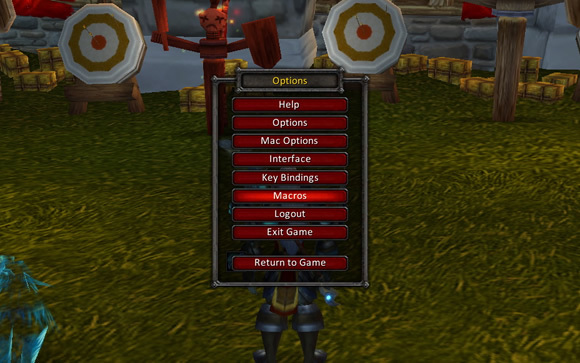 2) Open up your Macros interface in WoW by going to the game menu (esc key) and clicking on Macros. 3) You can select whether you want it to be a General macro, accessible across all characters -or- you can make it character-specific by selecting one of the tabs at the top. Next, click ‘New”. 4) Enter the name of the macro – usually 3-6 characters is fine, then click ‘Okay’. 5) Click inside the blank window and paste in the copied macro text by hitting ctrl+v (command+v on a mac). 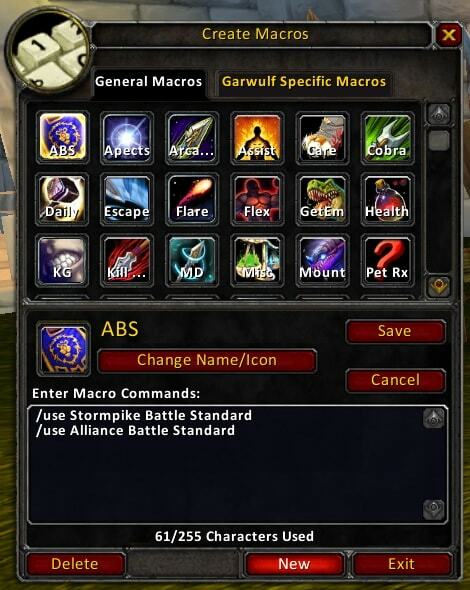 6) Click and drag the macro icon from the Macros interface down to your action bar and start owning with it! 7) In the image below, notice how I am able to simultaneously Silence one target while maintaining pressure on another – without having to re-target..? 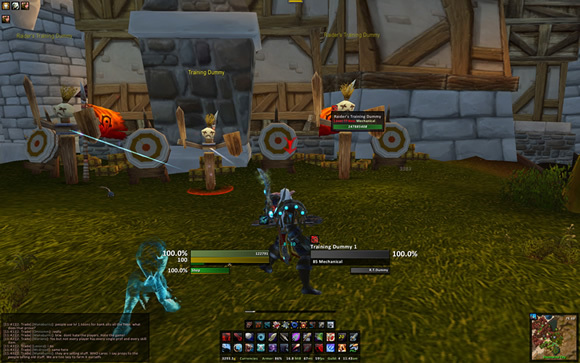 I am DPS’ing the center target dummy while at the same time silencing the one on the left. The image doesn’t show it, but I didn’t have to drop my current target in order to silence the other. I vastly improved the usability and efficiency of my Silencing Shot ability just by taking a minute to enhance it with a macro. I made it so that my Silencing Shot will instantly hit my enemy focus target if I have one designated, or fire at a mouseover target if I have one – all while I’m still pounding away on my primary kill target. Hopefully this short tutorial will help to demystify the practice of configuring and using macros. If you have additional questions about macros, please refer to my hunter macros page. What are you waiting for… start setting up some macros! I have very oily eyelids thus i tend to use water-proof cosmetics. my action bars are full but when i create a macro that combines more than one cast do i remove those casts from my action bars and place the macro in their place? hey just wondering this may seem like a stupid question lol but my action bars are full where do i drag my macros or if i combine a bunch of casts do i remove them from my bars to place the macro? First Thanks for the disclaming words, but i´ve 1 Question at all. Is there a way to combine the spells,”murder of crows, Stampede, and Alphatier” in one Macro? Gar…great stuff…TY so much for the time you give to help your fellow hunters..Cheers and Beers! and it doesn’t work! HALP! Frost Nova and Blink share a GCD – so the two spells won’t activate simultaneously – but you can spam the key and it will cast Frost nova and then Blink as soon as the GCD is up. HI there Gar! I’m just wondering how will I make that macro that will cast volley shots at Lich King while doing the tranquilizing shots at enraged shambling horror in just one key press (if it is possible). Or any macro that will do this kind of attack. I’m referring to LK fight (WOTLK 3.3.5) Thank you in advance and more power! I am having a problem like Antonium. I have made the macro for scatter shot, it will only say the shot and not perform it. Can anyone give me some help here? Anyone tell me how to do this? Just bought a new keyboard and decided maybe it’s time to try a macro or 2 *dips foot in the water* with my little hunter since finding a decent guild. mine seems to only speak it in the regular chat window and does nothing to the target. Help?!? Can you please tell me if i can use only generel focus macro and then cast keybinded shots?Not to put lets say silencing shot in macro added above? Sure… you can use a /target Focus macro to quickly target your enemy focus target, then just cast your shots as normal. I think that’s what you were wanting to know. Let me know if that doesn’t answer your question. That is just what i want to know,tnx! !I tried it and it works!I find it much easier for me to use focus and then fire proper shot. But i have one more question:can you please write macro for trap launcher+freezing trap.I cant find efective one and dont know how to make one myself. Thank you Gar, I really appreciate your effort and help!! Nice! Had to put an “@” before “mouseover” to get it to work though. Thanks! Thanks for commenting. I’m assuming it was the Wyvern Sting macro you were talking about..? It’s fixed up now.